The Heavy Duty Workbench Is Made Of Solid Steel And MDF Panel. Two Roll-Out Drawer Provide Enough Space For Storing Tools. It Also Has A Work Surface With A Sturdy MDF Board, The Bottom Shelf Is Designed To Store Heavy And Large For You. With This Item, You Can Tidy Your Tools And Take It Directly. Steel frame and heavy duty MDF panel, sturdy and durable. Two roll out drawers come with It for storing small tools. With a heavy duty work surface. A peg board Is idea for hanging small tools, easy to take on and off. Bottom shelf for storing heavy tools. the large and stable work surface,efficiently work on even larger workpieces. Material: Steel And MDF Panel. 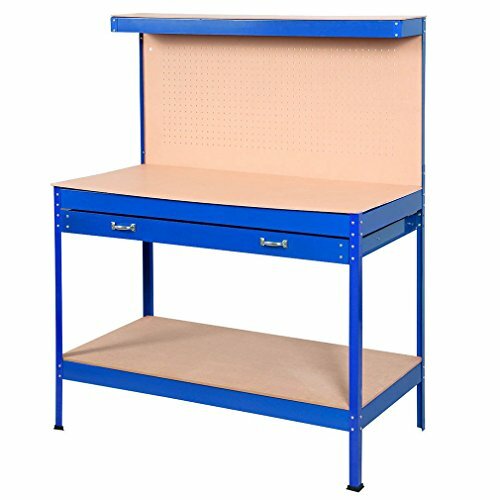 The Perfect Workbench:Solid steel frame and heavy duty MDF panel ensures stability and durability. The work surface can handle the heavy load of tool storage. Strong Bearing Capacity and stability:This workbench is constructed of a strong steel frame and holds up to 300 lbs;non-slip rubber feet adds stability and do not scratch your floor. Smart tool Storage: A peg board with hooks are ideal for hanging small tools,easy to take on and off.A draw with 2 handles for more tools storage. Comfortable Height And Spacious Working Area:features comfortable height 59"for work while seated or standing; 47" wide by 24" deep MDF worktop provides ample space for a multitude of operations and tool solution.